This is the summary of a safety inspection and evaluation of trails, accommodation and bridges conducted in April 2016 exactly one year after the April 2015 earthquake. The Langtang trek was the first commercial trek Lost Earth Adventures offered. But it’s not the only reason why this region is so dear to my heart. It was here that I proposed to Sarah, on the summit of Kianjin Ri, on a blue bird day in May. It was here that I bought an engagement ring from an aging, endearing Tibetan man as we passed through Langtang Village. 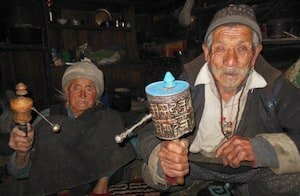 And it was here that I had spent many hours chatting over cups of yak butter tea with the lodge owners and residents. That had over the years become our friends. Everything is back to normal and we have run three successful treks into the Langtang in October 2016. Happy trekking everybody! News of the earthquake had emerged in drips and drabs and it was a devastating shock to discover Langtang Village wiped out by a colossal landslide. We lost many friends, including our Tibetan jeweller, whom most certainly can be forgiven for lying about the quality of his wares. It was a bargain at three quid (it’s the thought that counts) and Sarah says she’s forgiven me for turning her finger green! We also had friends at the Peaceful Guest House, whom over 8 years we’d been enjoying their hospitality. They will be missed by the countless trekkers and guides that called this place their home, if only for one night. If there are any lessons to be learned and good to come of this tragedy, then it is the opportunity to learn what types of buildings suffered the most and how best to locate new homes and buildings. 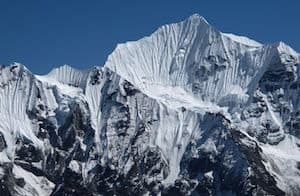 The Foreign and Commonwealth Office (FCO) had lifted its travel advisory against visiting Langtang and Manaslu in February. 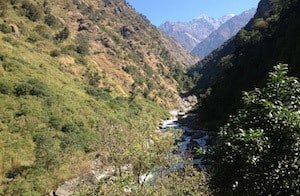 The Langtang was the last of the regions I was able to visit, and you can read a report on all of the other trekking regions by reading our other blog posts. I had stripped down to the bare essentials for the trip into the Langtang. 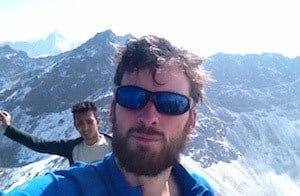 In Kathmandu I rationed my toothpaste and underpants, whittling down my gear to a rucksack that weighed a mere 5kg. 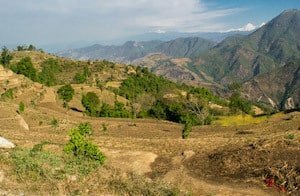 The itinerary was loosely set to run up the Langtang Valley, over the Gosainkunda Pass, down into Helambu while attempting a new trekking route on yak trails to Sikha Besi, two valleys north of Kathmandu. If time permitted we’d take a cheeky side trip to the 5150m summit of Surya Peak. I had nine days to do it. 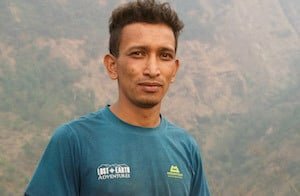 I was joined by one of our porters Binod, who had recently passed his Guide’s Exam. Being a Gurkha he his fit and strong and shows a passion for the mountains. The last two trips I’ve led he’s worked with me as a porter and has always had a large interest in the western style of leading expeditions. Binod lacks much spoken English, although he can write it very quickly and his English is improving every day. I thought I’d take this opportunity to show Binod the new trails enabling him to describe to all our local staff the areas to visit and avoid as well as conduct a risk assessment. Imagine Binod’s surprise when after trekking for twelve days around Manaslu, I wanted a lie in and didn’t mind missing the only bus from Kathmandu to the trailhead. 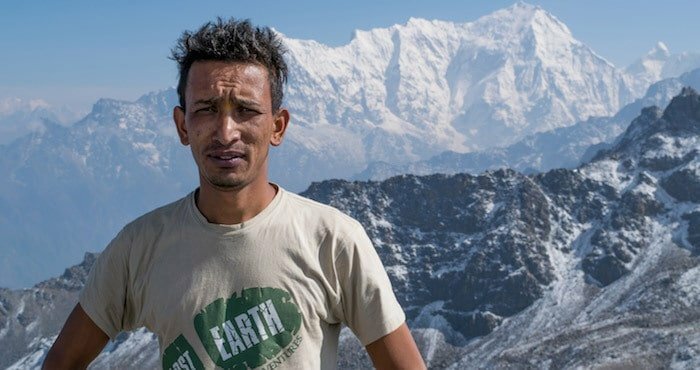 Unsurprisingly I received a call later that evening from KP, our Operations Manager in Kathmandu, expressing Binod’s worry that we didn’t have any bus tickets or organised transport arranged. But where’s the adventure in catching the bus? I relayed the game plan to KP. We’d stand on the roadside heading out of town with our thumbs struck and a smile on our faces. We’d have the pick of the lot, getting to choose the most luxurious of vehicles. Well, perhaps we weren’t in for the most luxurious, but certainly we were in for an interesting experience. The next morning I arranged to meet Binod at 7am for breakfast at the Himalayan Java Coffee Shop, emphasizing to Binod to pack light. Both were dubious to my plan, but neither had been able to experience travel through Nepal like I have. With my different clothes and exotic, bright face towering a foot higher than anyone else, I’ve never had to wait to long for a lift. There’s an air of excitement for the driver picking me up. More often than not, they don’t want money, but instead to take pictures of me and to chat cricket (which I know nothing about)! Well time had passed and there wasn’t a vehicle in site. I had been starting to regret my decision boasting for an hour over breakfast over how easy it’d be. Cockiness waning, the first of five vehicles we’d take trundled along. A large lorry pumping out diesel fumes covered in Hindu symbols and struggling up a hill at about 10mph. The trucks air brakes came on and I got the usual reception. The two men sharing the same passenger seat were hanging out the window wondering what I was doing and where I want to go. Soon there were three of them sharing the seat and in typical Nepali hospitality I was given the most comfortable place, a metal box with the gear stick between my legs. Four more vehicles and four equally comparable and absurd journeys later we stopped to enjoy the fabulous butter chicken curry at our regular haunt in Dunche, The Langtang View. Nourished and full we continued on, walking the three hours to Syabru Besi. Binod was as happy as I was to shun the bus, opting to walk to the trailhead for the pure love of walking. I was in good company. The new route into the Langtang is via Sherpa Gaon, and is actually an improvement on the traditional trail. This is also the route Sarah and I originally took when I wooed her with a £3 engagement ring! The trail follows high along the mountainside, offering much better views. Originally we had declined to take commercial groups this route because it used to have a rather harsh start. There were 1000m of very steep ascent, on the first morning of the first day of the trek. We prefer to break our clients into a long trek gently! Positively though, we discovered a new dirt road, accessible by jeep that allows us to get ¾’s of the way to the top of this hill. This development ensures a fairly leisurely 5-hour trek to the village of Sherpa Gaon. The trails along this route are in perfectly good condition, lodges are intact and the villages have not seen any damage. There is one path which is quite exposed for two 25m sections, where there are big drops. The path is 1.5m wide and easy to walk on, but it’s worth mentioning. Donkey trains carrying cargo and goods walk along these paths day in and day out over these sections, so it’s certainly not mountaineering or scrambling. I have put a photo to the left with Binod needing no encouragement to peer over the edge! On the second day of trekking the lower trail is joined early on at Rimche. 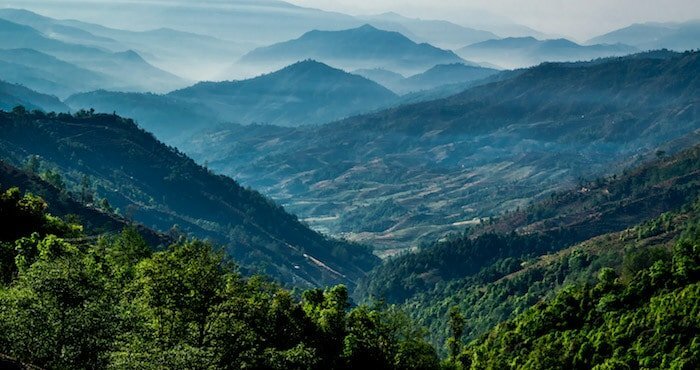 Rimche and all of the subsequent villages until you reach Thangsap are in good condition and nice for a bit of a wander and explore. When the earthquake happened, the vertical 7200m high southwest face of Langtang Lirung shed the majority of its glacier hanging from it. Whilst avalanches are a daily occurrence on Langtang Lirung they don’t fall anywhere near villages as they are sensibly placed far away. This was a freak occurrence. Normally entire glaciers don’t fall off mountains. To put this into perspective, an estimated 40,000,000 tonnes of snow, ice and rocks caused a pressure wave equivalent to half the power of the atomic bomb dropped on Hiroshima. This pressure wave destroyed the houses in the nearby hamlets of Thangsyap and Langtang Gompa but fortunately didn’t head east and unbelievably the village of Mundu 15-minutes walk past Langtang remained unscathed. The two lodges in Mundu are still open and the Tip Top lodge is still serving fresh coffee. There is also a new guesthouse now open in Langtang Village, two in Thangsyap and one was being built in Langtang Gompa as we passed through it. Kianjin Gompa did see some damage, but was not too badly affected. Around ten buildings had been damaged but most had been repaired and there were at least ten lodges open. There were also about fifty foreign trekkers at Kianjin and many men constructing buildings. See the picture to the left. 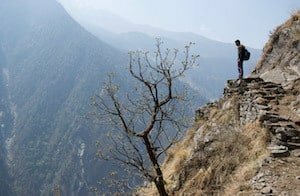 In summation of the upper route into the Langtang Valley: the trails and bridges are open and safe and there is ample safe lodging for the whole route. You will see some fallen down buildings around the Langtang Village area, but there are many workers out in force clearing up. They are ready to accept visitors, are keen for tourist money to stimulate the area and the mountains are as beautiful as always. Now is the time to come before the tourists return.  We surveyed the guesthouses for safety and have listed the safest ones along with their telephone numbers for all our guides to use when booking. Continuing our trail run we arrived in one what remains of Langtang Village for a ceremony marking the one-year anniversary of the earthquake. We had met two friends, Pema from the Buddha Lodge in Kianjin and Lhakpa from Dorje Bakery, which is still selling the best coffee and cakes in Nepal. It was a sombre and emotional experience as both of them lost family in Langtang Village. Our charity Share the Load Foundation is about to send a team of workers to help give the construction a solid push before the monsoon season. We continued further to Thulo Syafru, using the trail from Syrafru Besi and not from Pairo, which was in perfect condition. There is about ten open lodges in Thulo Syrafru, including our favourite, Peaceful Lodge. Heading up the hill we went to Chandanbari (Shin Gompa). The Yak and Nak, the best lodge in the national park was undamaged and even let us make cheese fondu in their kitchen! The rest of the village was in good shape with only one wall that had fallen down. The cheese factory and other lodges were open. Lucky enough time was on our side and on one of our final mornings we woke up at 4:50am (to a fresh covering of snow) at Gosainkunda Lakes for a pop at Surya Peak. Kitted out with limited gear in nothing but trail running kit enabled us to move light and fast, though presented its own challenges when presented with steep, snow covered rocks. We had definitely underestimated Surya Peak. Steep walls protect the summit and it took several long attempts at navigating exposed ledges and ramps, including having to backtrack 200m in altitude before finding a weakness to the summit. Both with packs less than five kilos it was a real pleasure to move so quickly at this altitude enabling us to rapidly explore the different routes. From the top we were totally surrounded by snow-capped mountains and could see ranges far into Tibet. Clouds were building quickly so after the obligatory handshake and summit selfie we were skipping rocks back down the ridge. Moving quickly was important but equally was not hurting ourselves as with minimal kit, total remoteness and no chance of rescue we had to be careful. 7 hours later we stopped for egg and chips at one of the two undamaged lodges in Phedi before running to Gopte in 1hr 20m. Our aim was to head west at some point to get to Sikha Besi. Our charity the Share the Load Foundation has just built a school there and the school lies at the bottom of a spectacular valley below Gosainkunda Lakes. We asked local advice and checked options on the map. 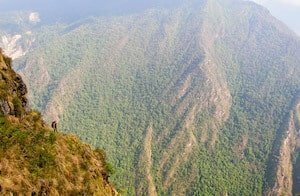 Unfortunately the sides of the valley are very steep and after an hour of descending a faint trail through dense forest we were thwarted by a landslide stripping our exit to Sikha Besi. Unfortunately we had to turn and retreat the 800m of altitude we lost up the steep hillside. We continued on to Kutumsung, Chisopani and through Shiva Puri National Park. Nine days after leaving Kathmandu we were back in the enchanting madness, feeling fit, strong and exhilarated. It was a tough push for both of us and we were happy with our achievement. 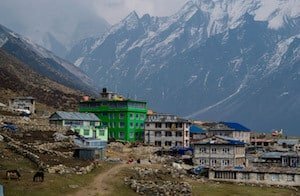 We were even happier to see that all the villages we’ve enjoyed so many times before had quickly moved on from the earthquakes, had suffered minimal damage outside of the Langtang Village area and the local people are more than ready to accept trekkers. 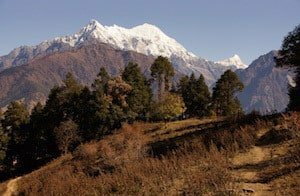 We’re leading treks to the Langtang, Helambu and Gosaikunda Lakes regions this autumn. We’ll see you on the trail! Read more about our Langtang trek, Gosainkund Lakes trek or Helambu trek.